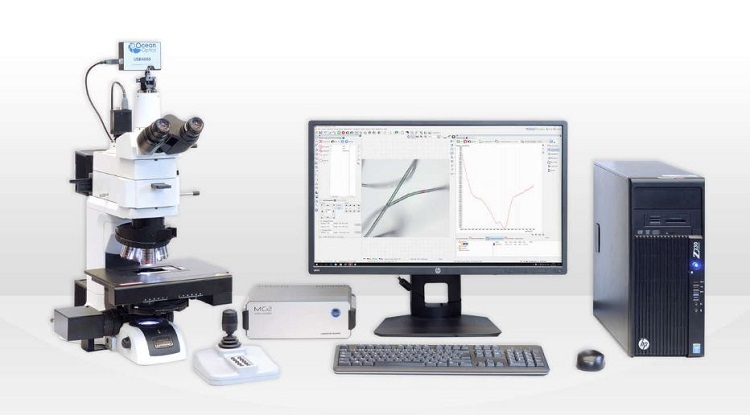 Combination of a fully equipped scientific grade Nikon microscope with a high precision motorized stage and a quality spectrometer guarantees an universal microspectrometry solution for analysis of various forensic traces including fibres, paint chips or inks. Camera image (approximately 3.2 x 2.0 mm for 5x objective) and spectrum of a defined area within the camera image (circle with a typical diameter of 40 µm for 5x objective) are viewed simultaneously. The spectrometer probe size can be tuned to the requested lateral resolution by selecting a proper pinhole in the spectrometer mount. A simple click within the camera image will move the sample spot directly into the spectrometer view with 1 µm precision. Any number of points within the whole sample can then be marked, automatically scanned and averaged to obtain the final spectrum. Transmittance/reflectance, absorbance and colorimetry modes are available. Acquired spectra can be stored into the database for archiving, exported into MS Excel or transformed into a simple PDF report.